Are you a new father? Do you want to make sure that your new baby is really yours? What is a paternity test? Click here to learn about DNA paternity tests. Over 1 and 25 fathers are raising someone else's child and don't know it. If you're worried if you're the real father, you're not alone. Of the countless fathers who don't know if they're the biological parent, few of them have taken a paternity test, and many of them don't know what one is. But, what is a paternity test? How can it get you the answers you're looking for? Read on to find out. Paternity testing is the DNA profiling of a man to see if he's the father of his son or daughter. Each delivery of the paternity test has its pros and cons, and many of them reliably determine a father's biological relation to a child around 99% of the time. All methods have been standardized, but some of them work better than others, while some are harder to get tested. How do you determine the right paternity test for you, and which of them work? In modern genetic testing, a baby's DNA is compared to its father. If there's a match then the results are positive. The paternity DNA test is determined by finding the genome of both parents and the child, then find similar patterns in the sequence of a genome. Genetic testing meant to find a true biological father can be found by targeting specific parts of a genome, such as the mitochondrial genome and nuclear genome. This DNA "fingerprinting" is thought of as one of the most effective ways to determine paternity. Though it's still not 100% accurate. Another common DNA test is known as a prenatal test. This decides if a man is the father of a child or not before the child is born. The fetal DNA is taken from the mother (this is non-invasive). Once the fetal DNA is taken, it's compared with the mother and father's samples. DNA testing begins. Results are made. This testing product is both non-invasive and requires simple painless DNA samples from all parties included. 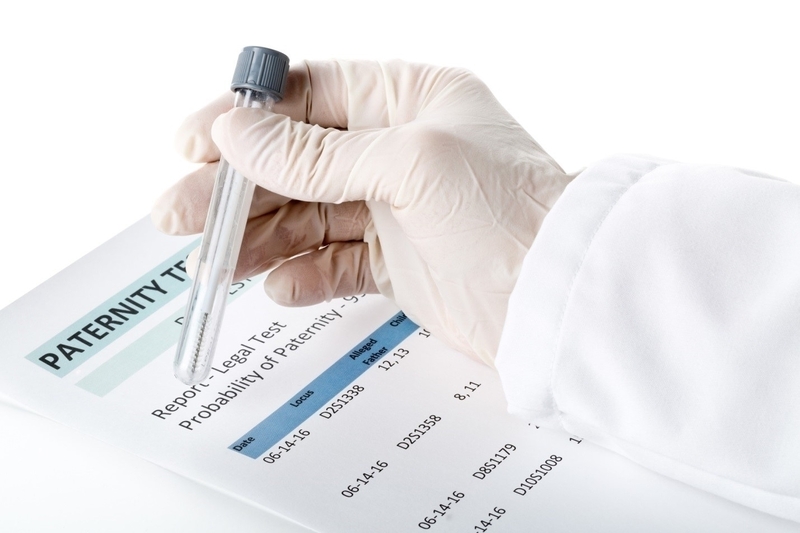 Blood typing is considered one of the first methods of paternity testing. The main issue with blood typing is that it cannot prove a father's relationship with a child. It can only disprove their relationship. ABO typing is the standard now for blood typing. It requires finding antigens on red blood cells and seeing if the observed alleles match with the parent. More than one man can share the same blood type and that makes it hard to deduce who is the father. The exact blood type of a child, if it's not in line with the inheritance of a father's blood type, can prove a father is definitely not the biological parent. There are specific regulations against genetic testing in many countries. Here's how to avoid getting into trouble. Britain released the Human Tissue Act in 2006 which mandated consent and testing accuracy between parents. Other organizations like the Department of Health have changed their standards. Those regulations in the US, like the Department of Health, have become flexible enough that now most clinics can do testing for a fair price. But there are stipulated limits are the number of days you can receive a test. Some run between 1 and 2 days, other 2-4. In other countries, the only way to conduct a paternity test is to receive a court order. Simply put, take these details and research them: if you're seeking a paternity test figure out the regulations in your region and if they apply to you. For some testing, it's easy to reduce your options to one. For instance, if you're a new father and your child hasn't been born yet, prenatal DNA testing is your best option. General DNA fingerprinting is another option once the child is born. If your child has already been born this method is the most accurate, yet tends to be quite expensive. On top of that, general DNA paternity tests often require a court order. Blood typing is your other option, you can conduct this through most medical professionals. But the issue falls under accuracy: blood typing cannot tell you anything except if you're not the father. So what ends up being your best option? The prenatal DNA test- is by far the most accurate and quickest response to the question: am I the father? Prenatal testing deals with this fear right off the bat. You don't have to wait until the pregnancy is over. The operation is non-invasive and painless. In some countries, the test is free. According to the American Pregnancy Organization, prenatal DNA testing is 99% accurate. Prenatal testing can be cheaper and can be conducted multiple times. Non-DNA paternity testing often costs less. Part of this is due to the non-invasive nature of prenatal testing. The procedure is renowned for being non-dangerous. In a world full of parents who don't know if they belong to their children or not, it can be rough. But now you have an answer to the question: what is a paternity test? The next step is finding out if you're the real father. The test is practically in your hands. Take this opportunity you have to find out if you're the father, so you can give your child the life it needs. In the aftermath of tests like this, if all goes positive, parenting is the next step. This can be equally hard as the doubts you have before. To learn more about ways to raise your child to be its happiest and healthiest self check out hifivebaby for more tips.